The second important moment in America's entry to the space race, Mercury-Atlas 6 saw pilot John Glenn perform three orbits of the Earth in a five hour flight, becoming the third man in orbit after Russians Yuri Gagarin and Gherman Titov the previous year. This site allows you to explore transcripts of radio communications between John Glenn aboard Friendship 7 and the NASA personnel at monitoring stations around the world, along with photographs taken both from the ground and by Glenn in space. 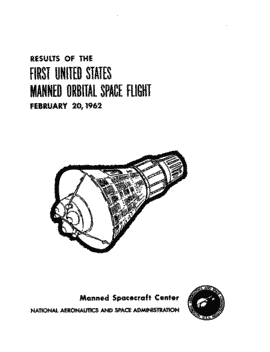 The main textual content of this site comes from a transcript of radio communications between the crew and mission control; there are some limitations which stem from the original recordings. Each line starts with a timestamp, in Ground Elapsed Time, which is the time (in days, hours, minutes and seconds or some subset for shorter missions or where we don't have timestamps down to the second) since lift off; photographs are shown inline at a suitable place. You can navigate through the transcript using the phases of the mission, and key scenes within them, or search for things that might interest you using the box at the top of the page. While browsing through the transcript, there are also links that take you to the same place in the original typescript. The Mercury capsule's callsign through the mission is Friendship 7; the CAPCOMs' call signs are location-dependent; for instance, “Muchea Cap Com” is Gordon Cooper. This site can be improved, and you can help — whether by correcting remaining errors (although we hope there aren't many left), by adding more photos, or marking further glossary items. The easiest way to report small errors, suggest new photos and so forth, is by dropping us an email to [email protected]. A /dev/fort production; our work is available under the CC-0 licence. Other images are from NASA or are otherwise in the public domain.